Cashews would have to be one of my favourite type of nuts to eat. I just love the taste of cashews and I admit I can happily eat a packet of these nuts on my own. 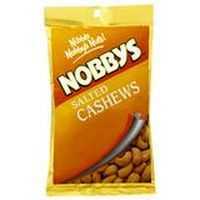 Salted cashews are one of my favourite types of nuts, and Nobbys is one of the best brands. Lovely amount of salt and always with a fresh taste,I th ink these win hands down! Another favourite that will never change, I could easily eat far to many of these but nuts are good fats right? So why feel guilty? Defiantly yummy definitely buy when I see them on special! Cashews are my favourite nuts and Nobbys my favourite brand! Certainly worth the extra money as they are perfectly salted and crispy crunchy! Definitely false economy to buy cheaper brands! Nobby’s salted cashews are heaven! I love cashews and Nobby’s are so delicious it is hard to stop eating them.Perfect for any occasion as every-one enjoys cashews in our home! This is a quality product and I love these salted cashews. On saying that, I love cashews and I think other brands are yummy too. This is a quality brand and the cashews are first rate. Once I start eating Nobbys cashew nuts I cannot stop. They are so delicious and I always have a couple of packs on hand if anyone drops in for a drink. Don’t keep them for a special occasion… eat some everyday! How would you rate Nobbys Nuts Cashews Salted?